The new Vixen has been found, and actress Maisie Richardson-Sellers has landed the role. Of course, the word "new" is relative, as this version of Vixen, Amaya Jiwe, is actually the grandaughter of the Vixen we've already seen, Mari McCabe (played by Megalyn Echikunwoke) on Arrow and her own series of animated shorts on The CW Seed. 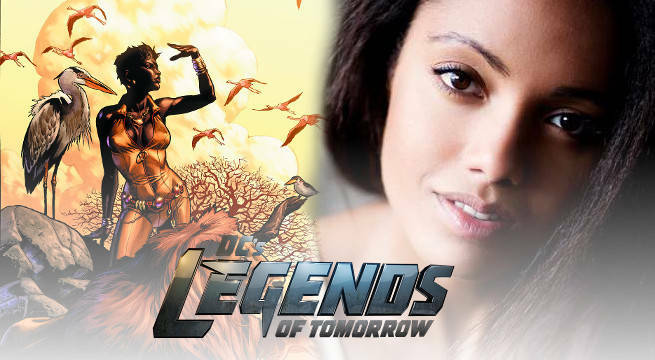 "Amaya Jiwe – better known as Vixen – is the newest superhero to board the Waverider and join the ranks of the Legends of Tomorrow," says The CW and WBTV's official character description. "Like her granddaughter, Mari McCabe, Amaya’s powers are derived from the mysterious Tantu Totem, which allows her to magically access the abilities of animals." Richardson-Sellers, who appeared on The CW's The Originals, as well as roles in Of Kings and Prophets and Star Wars: The Force Awakens, will be a series regular, joining the crew of Legends, which dwindled significantly by the season finale, with Captain Cold, Hawkman, and Hawkgirl all leaving the time traveling crew behind (in various ways). Legends of Tomorrow is part of The CW's now four-day block of DC Comics-related TV shows, airing each night at 8pm, with Legends airing on Thursdays beginning October 13, 2016. Supergirl will air Mondays, The Flash on Tuesdays, and Arrow on Wednesdays. All four series will also crossover next season, an unprecedented feat. Mari McCabe, meanwhile, will return this summer in season two of her Vixen animated series on the digital platform of The CW Seed (still starring the voice of Megalyn Echikunwoke).